This entry was posted in Personal Style, Pet Peeves, RTW, Suits, Work Wardrobe. Bookmark the permalink. Although, I do keep my suit or jacket pockets sewn shut, so they don’t get stretched out 🙂 is that a no-no in your books too? Don’t be mad that you bought something RTW. Even Julia Child went to a restaurant every now and then. The other one is that the pockets really do open and you have to unpick them. When I purchase jackets w/pockets I usually keep in the hidden stitching as it keeps the pockets from sagging and I don’t like putting stuff in my pockets anyway because it adds bulk. And I don’t need any more bulk on my body! Thank you for this “public service announcement”!!! I always want to tap strangers on the shoulder and tell them to take the stitches out:):) Pockets are a choice but it always amazes me how many people think they have “false pockets” and are clueless that they need to remove that stitching. P.S. It is okay to buy RTW!!!! Make the fun stuff that you enjoy. I have to admit, I’ve never seen anyone wearing anything with the telltale “X”. I hope I would have the courage to mention the fact that it should be removed if I ever do. Like others, I’ve been known to keep pockets basted, because of the bulk issue. LOL! I forgot about this X on a new dress I had bought and was out in public before I realized it was still on there. Quel horreur! I agree with you about the 1 vs 2-3 buttons on jackets. It’s good that you have found a suit that looks great, that’s taken the pressure off somewhat, I’m sure. We can’t make everything, and, now you can put off making a jacket for a while and sew something else. Re the sewn pockets, I keep mine sewn together too, same reason as others have said. I see a fair number of those Xs on winter coat vents. It’s always strangers, though. I would tell a friend to remove it but a stranger might not appreciate the gentle education. I think retailers are trying to make it more obvious than it used to be with the stitching blatantly not matching the garment. But your message may be getting out there. 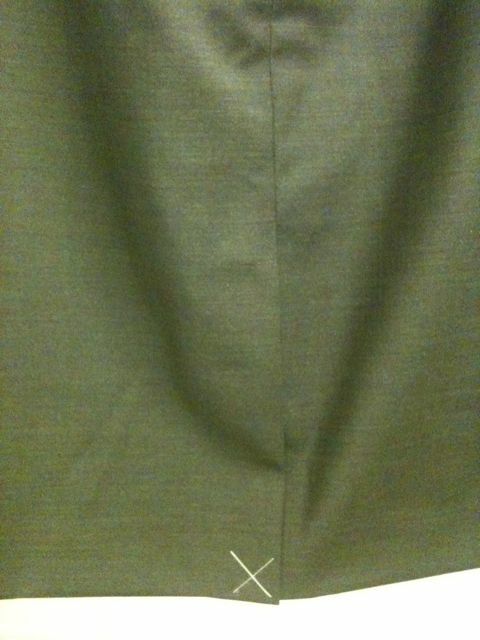 I saw two young men on the street the other day all dressed up on their way to the races and one of them was pointing out to the other that he should undo the vent stitching on his smart new suit.